Note: I was given a copy of this book for free for review purposes from Blogging For Books. No other compensation was received. This is an amazing recount of Matt’s first year as a medical intern. Matt is very candid, taking us inside of meetings, patient rooms and various sectors of the hospital. We get to see his struggles as he tries to find his place as a “real” doctor. It, to me, is very reminiscent of anyone’s first year of their new (chosen) career. You have to find your place- where do I fit in? He struggles to figure out what his relationship with patients should be, what is the right call in regards to patient care, and how does he maintain an actual personal life? Such a great peek into the medical world and the people that work there. I know that being a doctor is hard work, but knowing the many decisions that they have to make at any given moment is very intriguing. 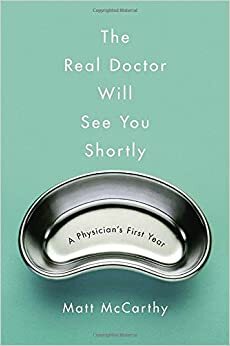 If, like me, you are a lover of medical dramas like Grey’s Anatomy and Private Practice- then you will love this book.